To build a brand...a high-end consumer brand, a brand experience conveyed through all-natural, authentic and healthful wonders from around the world -- the new and exciting derived from ancient cultures and guarded traditions, true to origins yet exceptional in quality, safety and consumer delight -- to bring to the mass-market a higher experience of truly unique, life enhancing, life-style enriching goods and services. ...started the company with a blank sheet of paper and a brilliant partner, Jeff Stein. With not one cent spent on advertising, the company operated an L.A. landmark storefront that was the destination of every "A" list celebrity that comes to the coast -- from Paul McCartney to Gwenyth Paltrow, to Leo Decaprio, to JLo, to you name it.. Elixir was recognized early on by industry experts as, "... the biggest media magnet, garnering more free editorial coverage year-after-year than the entire natural products industry put together!" ...fabulous success, two retail stores, a wholesale operation with products distributed world-wide, wrote a book published by Random House, etc. A ten year run, sold the brand, and the Wizard went on to bigger and better things! Needed professionals to handle all aspects of branding and traditional marketing as well as position the restaurant group in the center of the world of social media. Red Mesa Cantina: Relegated traditional print advertising to a 2nd tier channel. Implemented a social media strategy as the primary means of engaging customers. Used specialized tools to raise Facebook fanbase from 500 to over 12,000 targeting those living within a 10 mile radius. Producer of all events such as Halloween Contest, Cinco de Mayo, New Year's Eve, etc. 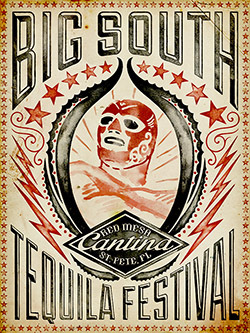 Recently conceived and produced the well received, Big South Tequila Festival. [See below]. Red Mesa Restaurant: Social Media became the primary means for reaching fans of this landmark St Pete restaurant. The focus via social media has been to feature the "foodie" appeal of this exceptional restaurant. Specials are organized into volumes that are promoted via social media channels. Hence, the reputation has come into a fine focus as the best and most authentic experience of regional Mexican and Latin American "alta cocina" (fine cuisine) dining. Red Mesa Mercado: Introducing the drive-by dining style of Southern California and Mexico to the local market. Concept includes a tortilla factory. 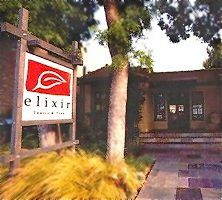 The first two restaurants are in the top ten (#7 & #8 TripAdvisor) out of almost 900 restaurants in the greater St Pete area. Fan bases are highly engaged and both restaurants continue to grow in their appeal as more and more locals and visitors add them to their favorite's list. Sales at Red Mesa Cantina have more than doubled in the last three years. Update: Mercado opened to great fanfare and is an anchor in the commercial disrict it is in..
As a competitive, distinguishing feature, Cantina turned its passion loose and created the largest selection of Tequilas and Mezcals in the South. Not satisfied, something further was needed to truly put Cantina on the map as the preeminent bastion of all things Tequila in the region. . The Wizard concluded that a Tequila festival was in order, not only to be the first in the area, but the biggest in all the southern region of the country. The name, the logo, the plan, all sprung from the Wizard team. An exclusive group of top distillers were invited to participate. All jumped at the chance. The Wizard set up a tasting program complete with Tequila passports, colorful stamps and plenty of samples. The first ever, distiller throw-down was orchestrated. 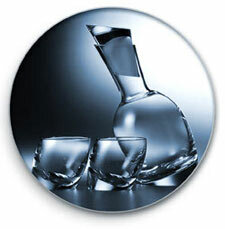 Each distiller, their recipe, their bartender, competing for trophies and prestige. Not content with mixing cocktails for a panel of distinguished judges, the Wizard organized a massive sampling marathon for the attendees so the crowd could participate in the judging as well. Almost 5,000 cocktail samples were served and a winner emerged from the madness. The winning cocktail is featured on the Cantina Specialty Cocktail menu until the next Big South Tequila Festival. Using primarily social media, in-house promotions and a co-sponsorship with Creative Loafing, it was hoped that 100-200 would sign up. The week of the festival 300-400 were expected. The day of, over 750 participated. Press coverage and massive crowd buzz followed setting in motion a great anticpation for the next festival. All objectives were met and exceeded making Cantina, clearly, "the" premier destination for all things Tequila south of New York and east of Texas. NBC contacted the Wizard after another group had failed after one year to produce a robust video player for their Your LA television program companion website. The need to was urgent and there was no margin for error or delay. The Wizard team kicked in and within four weeks had created a solution that met all specs and exceeded all expectations. .
KNBC now has the fastest video player on the market. It works flawlessly and on demand with no appreciable lag time. Competitor sites continue to load slowly and start playing after a long delay by comparision. NBC noted higher traffic, longer visits and more videos played per visitor than most other NBC affiliate or corporate owned sites. This, attributable to the robust and instant play nature of the Wizard Video Player. ART OF THE GIFT is a one-of-a-kind, L.A.-based service that offers a unique and distinctive collection of carefully chosen gift items for corporate and professional gift-giving. The proprietor is an über connected woman in the entertainment industry in Los Angeles. The clientele are all names you know, names you hear on a daily basis. The Wizard came in to help conceptualize the business model, develop the business plan and provide marketing support. The Wizard came up with the tagline, now oft-quoted in AOTG press coverage, "Never underestimate the power of the perfect gift." The Wizard is an ongoing advisor to AOTG. Launched with great media attention. The buzz campaign hit the right note in the right circles. The client list also now includes Sony, Showtime, AFV, Disney, The Mirage Las Vegas, MGM Grand, Treasure Island Las Vegas, CSI: Miami, Miami Vice, The Wire, numerous talent agencies, and lots of A-list celebrities. Life is good. NOTE: Download a copy of "Strategies for Reaching Today's Audience" a sample of Empresario-think... distributed to businesses in greater Los Angeles area, pitching the best targeted audience platform for the buck! As the second largest community cable station in the U.S., LA36 reaches over 700,000 homes from Bel Air to Silver Lake, from downtown to San Pedro, from Brentwood to Sherman Oaks. The channel needed a new business model in order to continue expanding beyond it's natural boundries. 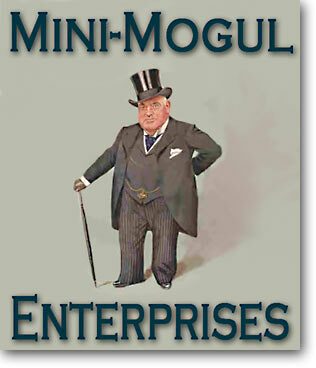 ...stepped in to develop a business model to augment the station's annual grant revenues. Along with a new model the Wizard helped realign operational systems to meet the needs of a new approach. 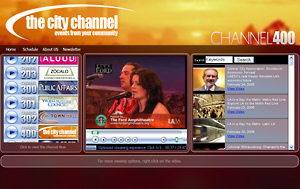 The Wizard team also worked with S. Weber, the station's program manager, to create a radically new online, multi-channel hub with hundreds of hours of original programming carried along a dozen channels of on-demand video plus a live broadcast stream. After many years in the travel business with a side-journey through the entertainment business, the principles decided to pursue their passion again which was adventure travel for groups sharing a common purpose. Hence, G2Adventures was conceived. The Wizard team was recruited to create a fundable business plan. A complete business plan with an integrated marketing plan was produced in a collaborative manner. The Wizard team helped the principles hone their strategies, their tactics, their metrics and their goals. The result was a brilliant plan that serves as a living, day-to-day roadmap. The Wizard is an ongoing advisor to G2. Business is going so well that they may not need to turn to outside financing. Trips with large affinity groups are currently traveling throughout the world and G2 recently forged a strategic partnership with a huge publishing company. The Wizard helped strategize and negotiate the terms of the contract. NBC has a national network of corporate owned and independent affiliate television stations. Shifting to a multi-platform communications strategy, NBC needed a simple one stop site that could aggregate the news gathering capabilities of the various NBC news departments. It worked so well the company decided to open the site to the public. The Wizard team studied best-in-class aggregation sites and found most fall short of anything other than basic RSS feeds. The Wizard knew that text alone would neither tap the potential of available material provided by the various NBC news groups but would also fall short of providing a fully satisfactory experience for visitors. The Wizard team figured out how to synchronize accompanying images along with the realtime stream of news stories from each of the eleven participating news departments. No surprise! ...a surprise hit from day one. CEOA, Inc., is a Canadian based company implementing a global digital currency. Partnered with IBM, EDS, Merrill-Lynch, and other large international players, CEOA, Inc., is attempting an end run around legacy systems that are too entrenched to respond quickly enough to sieze opportunties afforded by emerging technologies and the right alliances. ...the challenges are formidable, both in operationalizing the system as well as winning over and educating a massive global consumer audience. The Wizard team developed the business plan, the original marketing plan, and the complete set of SEC filing and registration documentation; executed a reverse merger, and CEOA is now trading on the pink sheets. The Wizard team has recommended positioning the brand to center around the notion of "the people's digital currency". The company went public. Significant funding was secured. A world-class, seasoned executive team now heads the company, strategic alliances are being secured; announcements are made almost weekly. Disclosure: The Wizard is a shareholder. CreditzUSA is now trading on the pink sheets as CEOA. 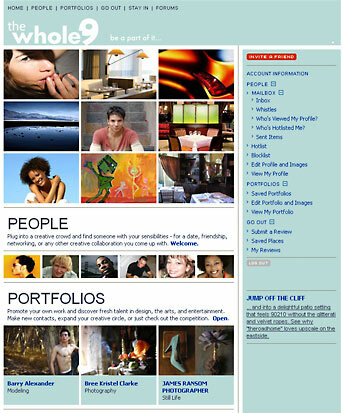 With their exceptional success at producing extraordinary high-impact marketing campaigns using everything from guerilla street teams to human parades to burning man showcases, the principals decided to offer up to their extensive network of connections and contacts to create an online sophisticated, upscale social experience for dating, networking and professional collaboration. The Wizard was recruited to the team to serve as the Social Architect, taking on the responsibiltiy of creating the world of theWhole9; to create processes that reflect the values and sensibilities of the user base; to create cogent, intuitive pathways and options defined by stated and unstated social rules of engagement. The net result is a compelling experience that appeals to adult professionals and adds value to their lives, be it on personal or professional levels. The Wizard is an ongoing advisor to Out of Bounds. Launched with great media attention. Launch parties and experiential marketing campaigns in key cities are set throughout the year. 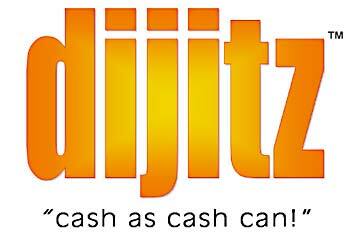 Dijitz is a branded form of stored value card systems. Dijitz develops card based systems for loyalty programs, debit cards and reward cards among others. Dijitz licenses it's know-how and provides co-branded back-room financial services as well as co-branded consumer card systems. ...conceived the brand and all the supporting elements into a cogent style-guide. Designed and TM'd the name, secured the domain. Developed the business and marketing plan. Consulted on how to leverage the B-to-B brand and build brand equity in a world of no-name competitors -- applying an "Intel Inside" strategy to build market share. The brand is drawing significant attention in the card-based financial services world. In addition to his very successful career as perhaps the most recognized Sportscaster in Southern California Fred Rogan is also a major auto afficionado. He leveraged his passion into a weekly auto show, "Whipnotic!" 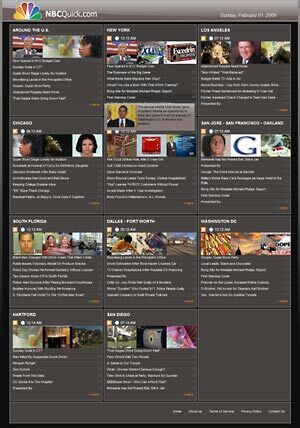 As part of NBCs multi-platform strategy, a world-class website was an important missing element. The Wizard team captured Fred's vision and seamlessly brings together the best-of-the-best content in an blog-centered website. 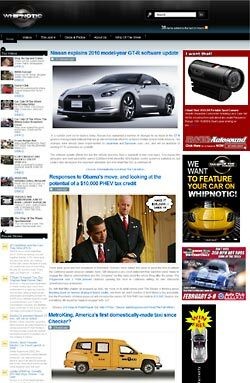 It continuously updates with the latest breaking news, mainstream and off-the-wall, providing Southern Californians, the keepers of the flame of auto love, a never ending stream of what they want to know about most. The multiplatform strategy expands NBC's ability to connect with afficionados by whatever means and whichever platform is most convenient to them at any given moment. The synergy of a television program with a tightly integrated website expands the value of each by an order of magnitude. To take a very successful, expert-centered educational consulting business and create a growth plan that allows the proprietor to maximize its potential as a business. ...developed the branding, the business plan and finetuned marketing strategies. Also, developing an online management system for tutors, students and parents. It is set up to track progress and facilitate interaction among all parties. Also, setting up internal management systems and controls, writing materials, and implementing online sales of books and study materials. With opportunties prioritized, the dream set to timelines, and infrastructure in place, the vision has become a reality. Over thirty employees and growing; expanded into the very lucrative student travel packages. 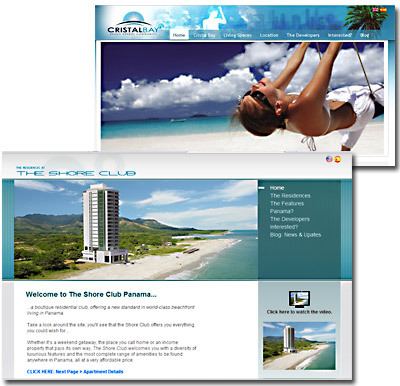 Create a sustainable real estate development company based in the Republic of Panama. In the first year of operation, projects totaled almost $84 MM retail value. Projects include apartment buildings along the beaches and affordable housing in the interior. 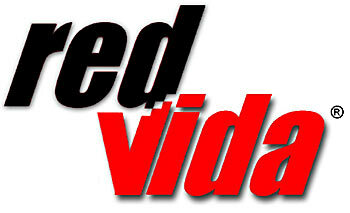 RedVida.com was a community-based web site for Latin Americans with forums and local activity features, the purpose of which, wass to engage Latinos from all over the southern and northern hemispheres in dialog and interchange. Architect from concept to deployment. Deveoped the style-guide, logo, mission definition. TM'd and secured domains. Assembled an international team; project manager in Scotland, programmers in Romania, Bosnia, Nepal, Egypt and India; translators in Cuba, Chile and Korea. Developed marketing strategy, recruited partners and allies, connected to Latin American celebrities for endorsements, participation, etc. Soft launched, 1.1MM unique visitors in first 30 days. Wide scale roll out growing to 3MM members. ...to implement an effective Internet presence for its various projects. Credibility has to be an intrinsic part of the experience since most sales are made before the buyer ever sees the property. ..created the style-guide with logos, websites, navigation, layout, the voice and copy describing the properties and their unique features so buyers would feel at ease and arrive at positive conclusions and act accordingly. Congruency of messaging is imperative for success, especially in the context of gobal economic chaos. 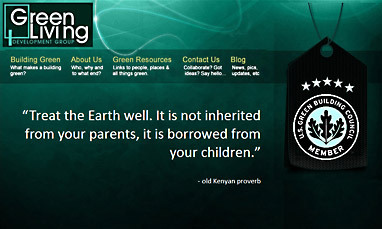 Read the manifestos and articles, all to set the context of credibility in the realm of "Green". An eBay Power Seller came up with a great idea to turn her already successful operation into a branded system to be sold to would-be eBay entrepreneurs in a simple, step-by-step format -- a guide and business model with everything you need in one complete turn-key program. ...came up with the brand positioning, style-guide and point of view. Flowcharted the growth plan, developed the strategy and designed the in-house systems and all the forms needed to grow the business exponentially. At another stage, will help craft the turn-key program with manuals, videos, CDs and web site support, as well as the marketing strategy for reaching aspiring eBay marketeers. The first part of the program is off and running. Sales are climbing and exceeding all expectations. Capstone Alliance is a venture capital and equities firm based in Los Angeles, California, that utilizes innovative approaches to investing and accelerating the growth of early-stage companies. ...conceived the brand, the name and complete style-guide with logo, mission, et al.. Co-wrote a comprehensive business plan with management team. Helping now with clarifying their message from which will come marketing strategies and proper support materials. Consulted on business model. Opened some important doors for them. Initial round of funding was successful. It's the classic tale of a well-oiled corporate machine overriding the quality of life of an established and quiet neighborhood for the purpose of short-term profits at the expense of safety, environmental impact and civic respect. ...developed the website design, layout, navigation, construction, et al, using Google maps to graphically demonstrating in clear visual terms the core of the problem. The Wizard set up a Twitter chain of communication so neighbors can receive text updates on their cell phones, swarm and disburse at the blink of an eye. The Wizard, in an inspired manifesto-writing mood filled in the sections with empassioned verbiage. The site was designed so multiple authors could tackle different parts and a blog/comment invited maximum community participation..
Amassed Media is a reseller of media credits, an evolution of the barter world of commodities. AM procures media credits from media buyers and resells them to clients at deep discounts. ...concieved the brand definition and name, style-guide and all the elements of a strong B-to-B brand; mentored the team through the development of their business model and marketing strategies. Also, created a business/marketing plan. Additionally developed systems processes and controls, making the whole experience more professional and accessible to clients; Improved cycle-time on quote requests by 50%. Sales exceed plan. Customer satisfaction and retention is very high. Great buzz and word-of-mouth is driving sales, advertising budget cut to $0. CultivaCare is a healthcare solution provider with programs to cut medical costs and improve services to Medicaid patients. ...conceived the name and develped the style-guide with logo, mission statement and public presentations. Developed the business plan and provided extensive market research. Helped develop the concept, flowchart process and produced presentation materials. With economic conditions as they are, the Florida Legislature is considering the implementation of a pilot program. Interest is high in the states of California, Texas and Georgia. Rising Nations, Inc., is an SBA 8(a), SDB company organized to serve a broad range of needs of the 542 Native American Nations. ...came up with the name. Designed the logo. Consulted on business model. Everyone involved has high hopes on being able to do good work. Their motto came to them from a Native American Medicine Man, "Do well by doing good." Global Good Services, is a 501(c)3, non-profit organization committed to serving the needs of the Native American Indian Nations, from healthcare, to education, to economic development. Part of its mission is the creation and management of a Global Good Standard, a code of conduct that commercial members abide by in their dealings with Indian Nations. ...developed the GGS Seal concept, designed a turnkey program from the ground up, providing strategic support as the system readies for implementation. Launch is set to conincide with a Native American Nations conference in Tulsa, Oklahoma. Protect assets, maximize earnings and reduce tax liabilities utilizing the support services of best-of-breed marketing, strategic, legal and accounting experts. ...given that it started out as my own company that will never be taken public or sold I decided to go bold and over the top with tongue-in-cheek grandiosity in my first logo (below). 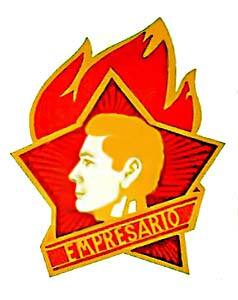 Empresario in Spanish means, Entrepreneur. This original logo was a lift from a Soviet Union medallion with an old General's face, morphed into a reasonable facsimile of yours truly. My kids got a kick out of it.